Scheme 1 Rapid Transit System: Preferred Scheme From The Jacobs & Davies Report. Transit is the talk of the region these days and Edward J. Levy's webbook Rapid Transit in Toronto: A Century of Plans, Progress, Politics and Paralysis is a timely body of work that provides useful historical lessons and insights as today's politicians, planners and citizens discuss ways to build and finance transit infrastructure. 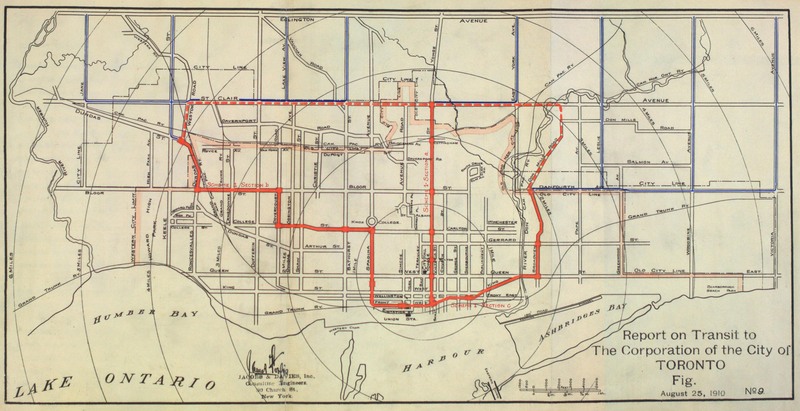 The webbook published in collaboration with The Neptis Foundation is a treasure trove of rare, historical maps and plans dating back to the early 20th century which tracks numerous but unsuccessful attempts to build a rapid transit network that placed Toronto at the centre of a vast, interconnected region. Levy says there has never been a shortage of creative and robust rapid transit plans which, had they come to fruition, might have created the integrated network Toronto never built and now needs more than ever. Instead the history of attempts to build a rapid transit network in Toronto has been a sad story of missed opportunities. 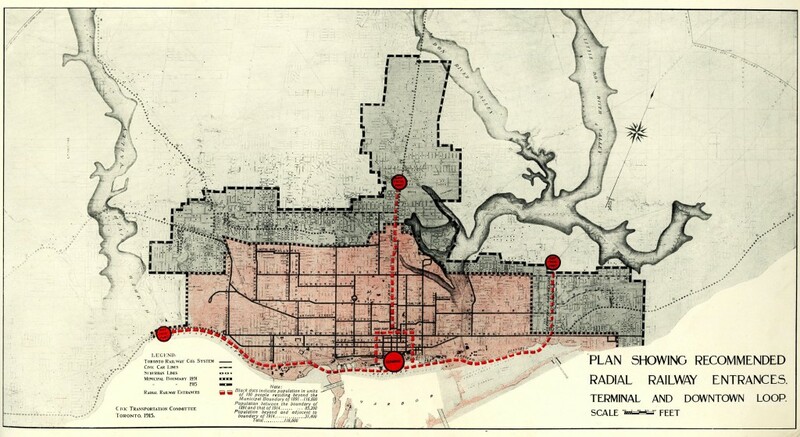 Many of these plans contained the concept of a U-shaped subway line extending east and west of the city core, the long sought "network builder" that would have allowed Toronto's skeletal subway system to become a true network offering several well distributed and integrated interchanges, built-in redundancies in the case of train breakdown, area-wide connectivity and operating flexibility for the benefit of the majority of riders across the city and region. In the postscript to his book: Completing the Regional Connection, Levy argues that the rebirth of regionalism with the creation of Metrolinx and the Province of Ontario's "Places to Grow" plan for south/central Ontario provides the backdrop to what should be our next grand in-city subway building exercise. "In doing so the Greater Toronto Region must learn from its history and do it right," said Levy. 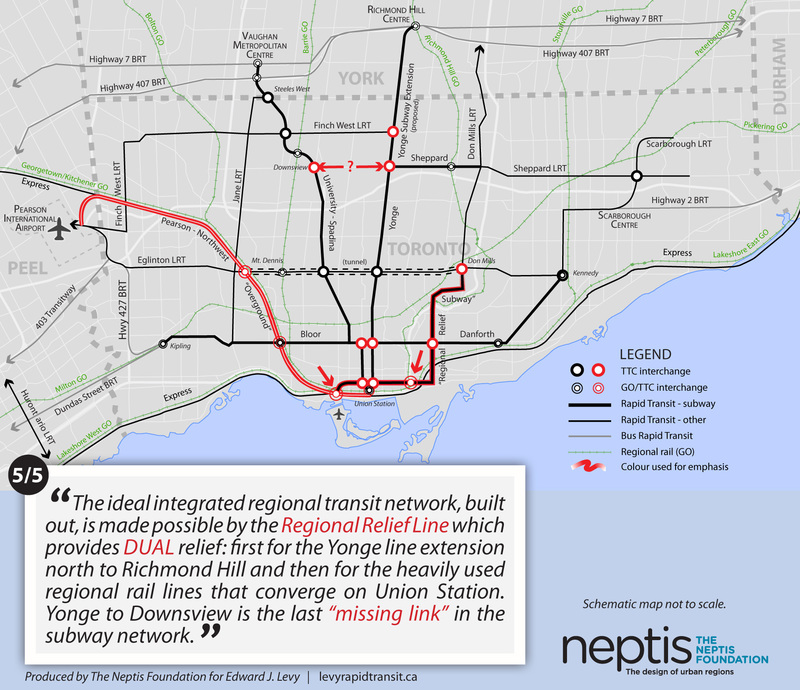 His solution is the Regional Relief Line which builds on the idea of the proposed but very limited Downtown Relief Line, and places it squarely in a regional context, showing how a series of modifications would reduce congestion across the region, and allow a 50-year discussion about the integration of GO Transit and the TTC to become a reality. "It is crucial that the tiresome downtown-suburban dichotomy over such projects be expunged from the discussion because this line could become the ultimate network builder, linking TTC and GO Transit services, thereby serving the whole region," said Levy.